Puzzle based on the Italian Holocaust film Life is Beautiful / La vita è bella. This is a revision exercise disguised in a fun activity. 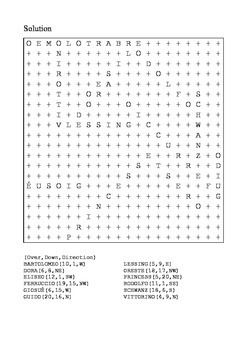 Students are asked to find the names of 12 characters from the Roberto Benigni movie in the grid. They are then asked to write a short paragraph explaining each character's role. This, and my other resources for Life is Beautiful can be purchased at a 50% reduction as part of a bundle. Check out Life is Beautiful - Active Learning Resources Bundle for Mixed Ability for further details.